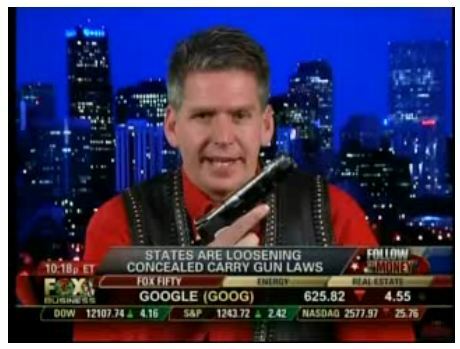 In the December 21 edition of Fox Business’ Follow the Money, host Eric Bolling shows obvious excitement as Fetishist TV personality, Rich Wyatt fondles and brandishes his little pea shooters to compensate for some other shortcoming. This is an obvious attempt to normalize guns in US culture. This entry was posted on Thursday, December 22nd, 2011 at 5:05 pm and is filed under Uncategorized. You can follow any responses to this entry through the RSS 2.0 feed. You can leave a response, or trackback from your own site.